Includes rotors, calipers, caliper brackets, brake pads, rotor spacers, and hardware. 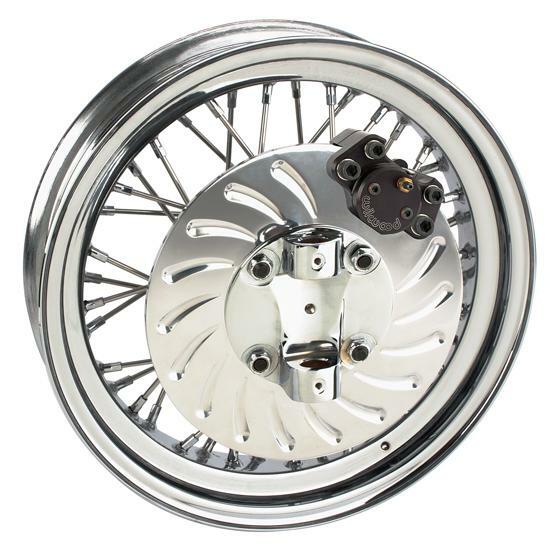 Our lightweight T-bucket disc brake kit for wire wheels includes 360 degree caliper brackets, steel rotors, Wilwood aluminum single piston, floating calipers and hardware. Works with '37-'48 style Ford passenger car spindles. Note: Wire wheel and spindle are shown in photo for reference only and are NOT included in the brake kit. OEM-style rubber brake hoses generally cannot be adapted to Wilwood calipers. The caliper inlet fitting is a 1/8-27 NPT. The preferred method is to use steel adapter fittings at the caliper, either straight, 45 or 90 degree and enough steel braided line to allow for full suspension travel and turning radius, lock to lock.